The guitar pictured above is a Ryoji Matsuoka No. 17. This guitar pre-dates the popular 'M' Series' of Matsuoka guitars. With the M Series the number of guitar reflects the price (M20 costing 20,000 yen for example). The number 17 presumably also reflects this, but unusually this guitar unquestionably has a solid top(I believe cedar), which you wouldn't necessarily expect if the cost was 17,000 Yen. Possibly though, as given the lack of serial number on the neck block (which seems to have come in around 1974) and the lack of number on the label that was in place in at least 1972, and possibly earlier, a 17k price tag may have been enough to justify a solid top then, and my belief is that this guitar is likely to have been made around 1970 or possibly before. The back and sides are laminated. 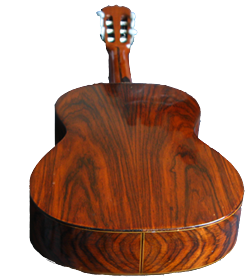 (A light wood, possibly maple, spruce, or maybe cypress can be seen on the inside of the sides, and rosewood on the inside of the back. The outside is an attractive zebra wood that has been bookmatched. There is a skunk stripe on the back of the neck covering the truss rod, and the fretboard and bridge are made of rosewood . The label is of the style used in the early 70s. (Ryoji Matsuoka, Luthier, Construccion Artistica De Guitarras, Nagoya Japon) The style of the matsuoka labels changed slightly in the mid to late 70s, becoming a bit more flamboyant and dropping the 'Nagoya'.